Frente Negra Brasileira (Brazilian Black Front) originated in the city of São Paulo, Brazil on September 16, 1931, and was the first Afro-Brazilian organization demanding full participating rights in Brazilian society. Headquartered in São Paulo, it spread around the country. Its complex structure included a Grand-Council with a President, Chief, and Secretary, supported by an auxiliary council. A Voz da Raça (The Voice of the Race), the institution’s newspaper, was created on March 18, 1933. The 1920s and 1930s changed Brazil. It embraced capitalism, gradually shaking its agrarian roots. Rising nationalism, gradual industrialization and urbanization led to political transformations, including the establishment of the first black newspaper, Clarim d’Alvorada and, later, Frente Negra Brasileira. Afro-Brazilians battled the consequences of slavery, abolished in 1888. Lack of economic opportunity, education, and civil rights barred their full participation in society. Getúlio Vargas, President from 1930 to 1945, came to power through a military coup but courted the urban middle and working classes to the detriment of rural landowners and, thus, indirectly benefited Afro-Brazilian city dwellers. Radical forces on the left and the right threatened the regime, and, after a communist attempt at taking power in 1935, Vargas staged another coup, initiating the period of Estado Novo (the New State, 1937-1945). Marked by increased concentration of power and curtailment of civil rights, Frente Negra Brasileira, then a political party, was outlawed, surviving under the name União Negra Brasileira until May of 1938. In this context, for the first time, a large number of Afro-Brazilians organized politically, seeking to redefine their identity, take pride in their heritage and fight racial prejudice. 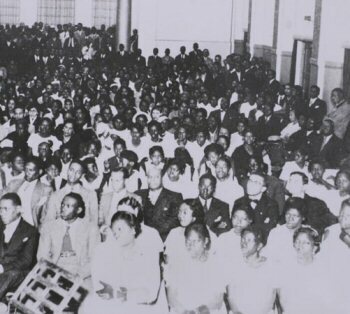 In a prelude to civil rights movements later on in the century, Frente Negra Brasileira pioneered an agenda of integration based on education, black cooperation and solidarity and combat of racial prejudice. Voz da Raça highlighted Afro-Brazilian’s contribution to the country and its history – a fusion of the prevalent nationalism with black pride and power. The legacy of Frente Negra Brasileira was evident and its fight continued to the present day. Kimberly Jones-de-Oliveira, “The Politics of Culture or the Culture of Politics: Afro-Brazilian Mobilization, 1920-1968,” Journal of Third World Studies, v. 20, part I (2003); Elizabeth Marchant and Fernando Conceição, “An Interview with Fernando Conceição,” Callaloo, v.25, n.2 (Spring 2002); Quintard Taylor, “Frente Negra Brasileira: The Afro Brazilian Civil Rights Movement, 1924 1937,” Umoja: A Scholarly Journal of Black Studies 2:1 (Spring, 1978). of Black Studies 2:1 (Spring, 1978).